Holy Hieromartyr Kirion II (known in the world as Giorgi Sadzaglishvili) was born in 1855 in the village of Nikozi in the Gori district. His father was a priest. He enrolled at the parochial school in Ananuri, then at the theological school in Gori, and finally at Tbilisi Seminary. In 1880 he graduated from the Kiev Theological Academy and was appointed assistant dean of the Odessa Theological Seminary. From 1883 to 1886 St. Kirion was active in the educational life of Gori, Telavi, Kutaisi, and Tbilisi. 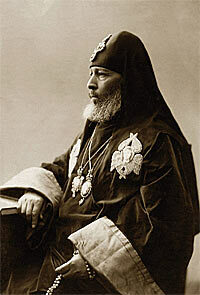 In 1886 he was appointed supervisor of the Georgian monasteries and dean of the schools of the Society for the Renewal of Christianity in the Caucasus. He directed the parochial schools, established libraries and rare book collections within them, and published articles on the history of the Georgian Church, folklore and literature under the pseudonyms Iverieli, Sadzagelov, and Liakhveli (the Liakhvi River flows through his native region of Shida [Inner] Kartli, the central part of eastern Georgia). In 1886 God’s chosen, Giorgi, was tonsured a monk with the name Kirion, and he was enthroned as abbot of Kvabtakhevi Monastery. Kirion continued his scholarly pursuits and intensified his spiritual labors. He collected folklore and ethnographic materials and studied artifacts from ancient Georgian churches. He generously donated the reliquaries and rare manuscripts he found to the antiquities collections at the Church Museum of Tbilisi and the Society for the Propagation of Literacy among the Georgians. In 1898 Kirion published a description of the historical monuments of Liakhvi Gorge. His publication is an important resource for scholars and historians, since most of the monuments he describes were toppled by Georgia’s ideological and national enemies in subsequent years. (Kirion would later join the Moscow Archaeological Society.) In August of 1898 Archimandrite Kirion was consecrated bishop of Alaverdi. St. Kirion began at once to rebuild Alaverdi Church, and he offered his own resources for this momentous task. At the same time, he began to study the ancient artifacts of Kakheti and Hereti in eastern Georgia. Among the manuscripts he turned over to the Church Museum of Tbilisi was a Holy Gospel from the year 1098, unknown to scholars until that time. Bishop Kirion was a tireless researcher, with a broad range of scholarly interests. To his pen belong more than forty monographs on various themes relating to the history of the Georgian Church and Christian culture in Georgia. He compiled a short terminological dictionary of the ancient Georgian language and, with the linguist Grigol Qipshidze, a History of Georgian Philology. Kirion fought the appropriation of Georgian churches by the Armenian Monophysites. 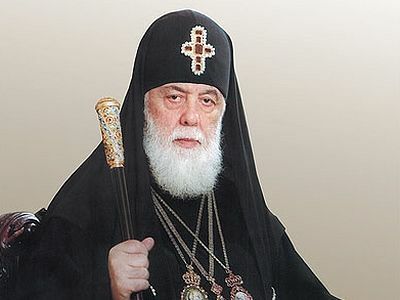 He sent a detailed memorandum to the Russian exarch in Georgia demanding that the confiscated Orthodox churches be returned. In 1901 Kirion was installed as bishop of Gori. By that time it had become clear to the Georgian exarchate that the educated and progressive clergymen were endorsing the holy hierarch Kirion and contesting the abolition of the autocephaly of the Georgian Church. But the government found a way out of this “dangerous situation” by frequently reassigning St. Kirion to serve in different parts of the Russian Empire: in 1903 he was reassigned to Cherson, in 1904 to Orel, and in 1906 to Sokhumi. In Sokhumi St. Kirion exerted every effort to restore and revive the historical Georgian churches and monasteries, though he would soon be reassigned to the Kovno diocese. In 1905, at the demand of Georgia’s intelligentsia (under the leadership of St. Ilia the Righteous), the regime formed an extraordinary commission to formally consider the question of the autocephaly of the Georgian Church. St. Kirion delivered two lectures to the commission: one on the reasons behind Georgia’s struggle for the restoration of an autocephalous Church, and the other on the role of nationality in the life of the Church. 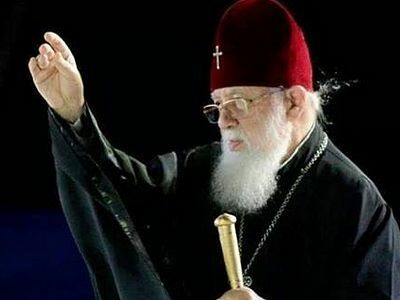 The commission rejected the Georgian claims to autocephaly and subjected the leaders of the movement to harsh repression. By the year 1915 the regime had ceased to persecute St. Kirion. They restored him to the bishopric and elevated him as archbishop of Polotsk and Vitebsk in western Russia. He was not, however, permitted to return to his motherland. In March of 1917 the Georgian Apostolic Orthodox Church declared its autocephaly restored. At the incessant demands of the Georgian people, St. Kirion finally returned to his motherland. One hundred and twenty cavalrymen met him in Aragvi Gorge (along the Georgian Military Highway) and reverently escorted him to the capital. In Tbilisi St. Kirion was met with great honor. In September of 1917 the Holy Synod of the Georgian Orthodox Church enthroned Bishop Kirion as Catholicos-Patriarch of All Georgia. During the enthronement ceremony at Svetitskhoveli Cathedral, St. Kirion addressed the faithful: “My beloved motherland, the nation protected by the Most Holy Theotokos, purified in the furnace by tribulations and suffering, washed in its own tears: I turn to you, having been separated from you, having sought after you, having grieved over you, having sought for you and now having returned not as a prodigal son, but as your confidant and the conscience of your Church. Soon after he was enthroned, St. Kirion sent an appeal to all the Orthodox patriarchs of the world in which he described in detail the history of the Georgian Church and requested an official recognition of her autocephaly. On May 26, 1918, Georgia declared its independence. The next day Catholicos-Patriarch Kirion II presided during a service of thanksgiving. The chief shepherd and his flock rejoiced at the restoration of the autocephaly of the Georgian Church and the independence of the Georgian state, though from the beginning they perceived the imminence of the Bolshevik danger. The socialist revolution, now showing its true face, posed an enormous threat to the young republic and her Church. On June 27, 1918, Catholicos-Patriarch Kirion II was found murdered in the patriarchal residence at Martqopi Monastery. The investigation was a mere formality and the guilty were never found. Rumors were even spread that St. Kirion had shot himself. 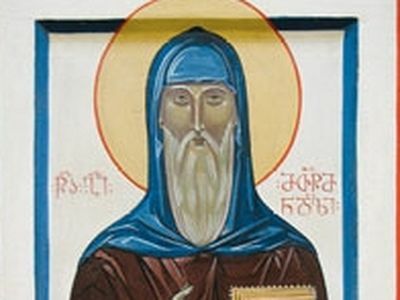 When the Holy Synod of the Georgian Apostolic Orthodox Church convened on October 17, 2002, it canonized Holy Hieromartyr Kirion and numbered him among the saints. Shamed be thy slanderers, for the nation had chosen thee to be its guide on the newly righted course. 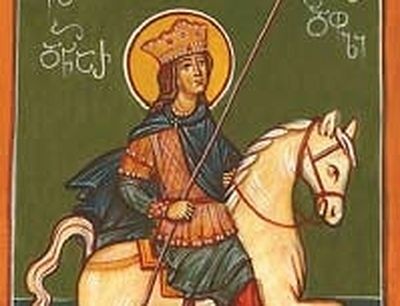 O thou who didst suffer the enemy’s treachery and dost shine forth for eternity, Holy Hierarch Kirion, pray to God for the salvation of our souls! Saint Giorgi’s family had its roots in the region of Samtskhe in southern Georgia. 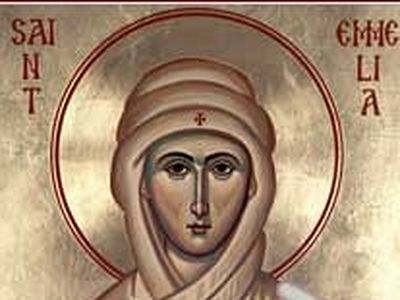 Giorgi was born in Trialeti to the pious Iakob and Mariam.When Giorgi reached the age of seven, the God-fearing and wise Abbess Sabiana of Tadzrisi Monastery in Samtskhe took him under her care. 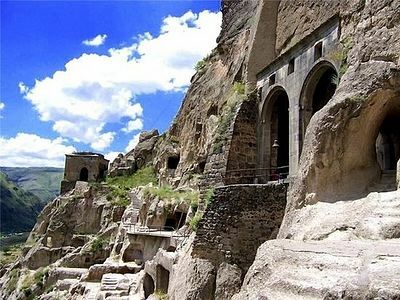 Giorgi spent three years at Tadzrisi, and when he was ten his father sent him to KhakhuliMonastery, to his own brothers Sts. Giorgi the Scribe and Saba. The Russian Church has preserved chronicles of the life of Queen Dinar, a woman who achieved much on behalf of the Christian Faith. For years scholars have disputed about the historical figure discussed in great depth in the Russian Church. Many believed that the sources described Holy Queen Tamar, but the period of Tamar’s rule does not match that of the figure described in the chronicles. St Basil the Great’s mother St Emilia was the daughter of a martyr. On the Greek calendar, she is commemorated on May 30.